Yesterday we wrote about a BBC news article which originally claimed social media crimes accounted for 'at least half' of front-line policing. 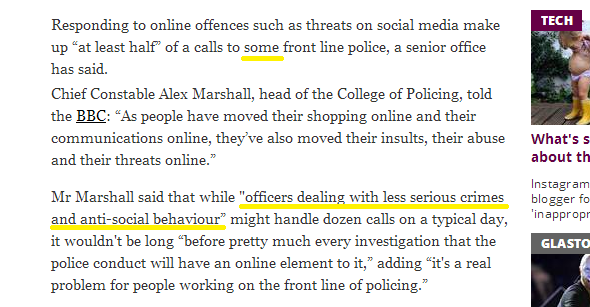 They've since updated the article to clarify the quote - from an interview with Alex Marshall, the head of the College of Policing - was in reference to calls, not all front-line police work. The College of Policing also clarified to us yesterday morning that they meant half of all calls to police officers dealing with low level crime, so not all front-line police officers either. We've asked the BBC to update their headline to make this clear. We've also contacted the Independent and the Daily Telegraph who picked up on the story, correctly referring to calls but still suggesting all front-line police officers. Or, in the Telegraph's case, all police officers.